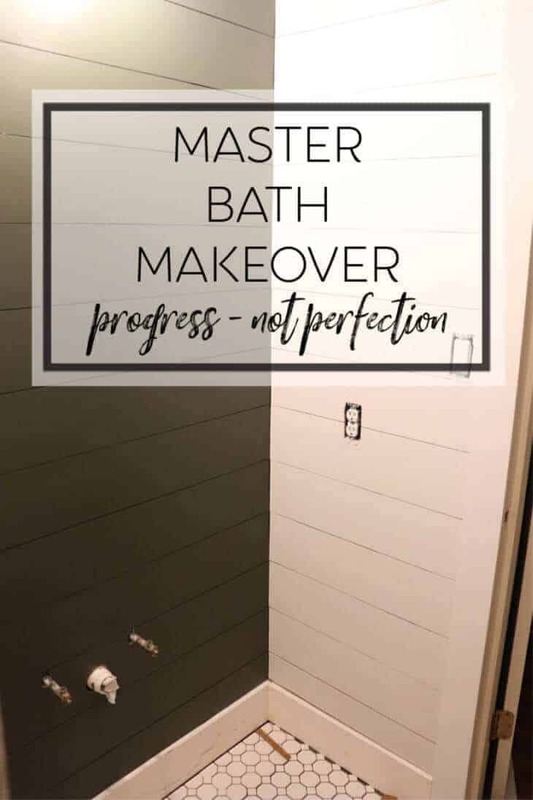 Master Bath Makeover – Progress Not Perfection. Sometimes renovations don’t go as quickly as we hope, but little steps can still add up! Have you ever thought your life was just like a movie sometimes? More often than not, I find myself repeating those little catch phrases from my favorite flicks. This week, “What About Bob?” was circling through my brain. This week was filled with nothing but baby steps. But all those baby steps will add up to something big in the end. As I mentioned last week, our Master Bathroom renovation came to a screeching halt. And this week wasn’t much better. 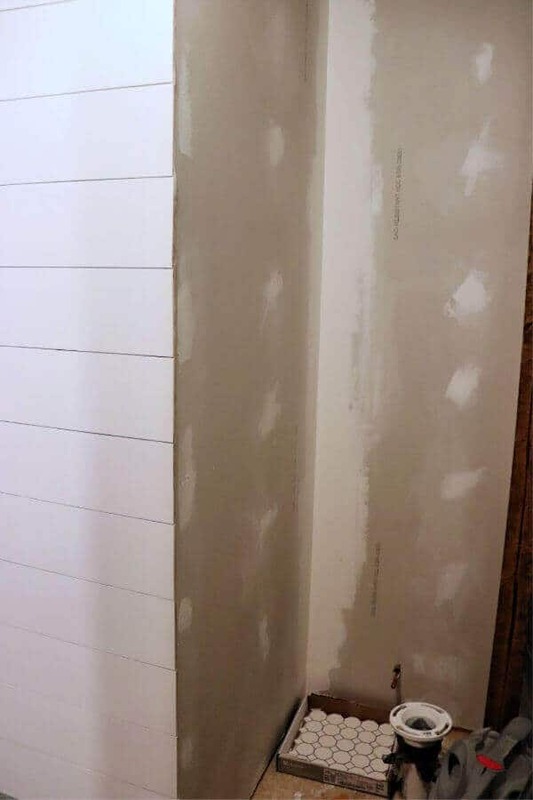 We hung the sheetrock on our new walls and got them prepped for painting. The dust was a-flying y’all! We thought we had a huge surprise when our cast iron shower pan arrived early, but we had to contact the company because of a manufacturing defect. I called the company, Bootz, and they replaced the drain pan free of charge. 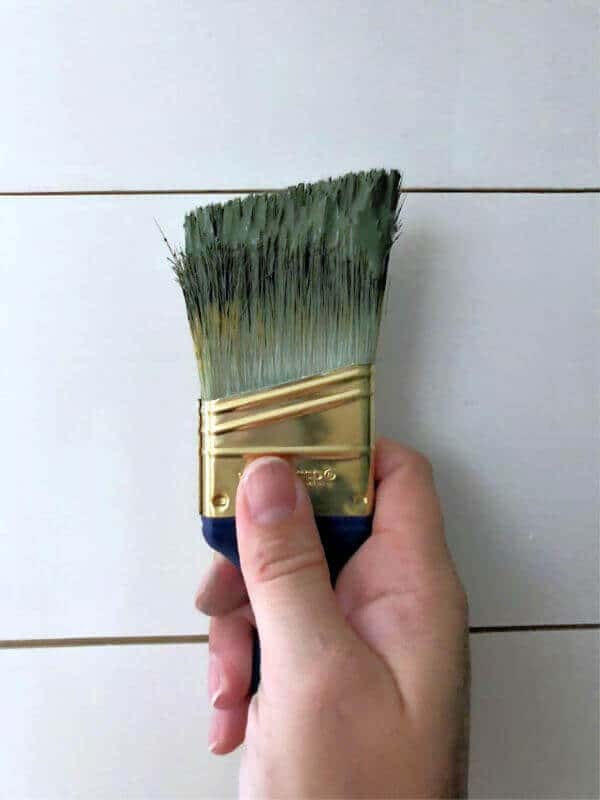 It just arrived moments before publishing this post so we will start tiling tomorrow! 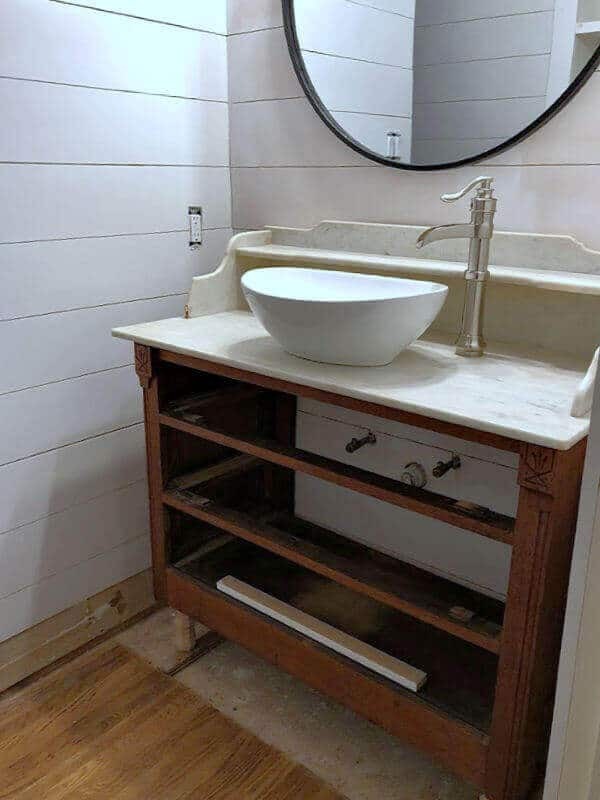 In the meantime, we focused on the front vanity area of our bathroom. And a sweet, serendipitious thing happened. 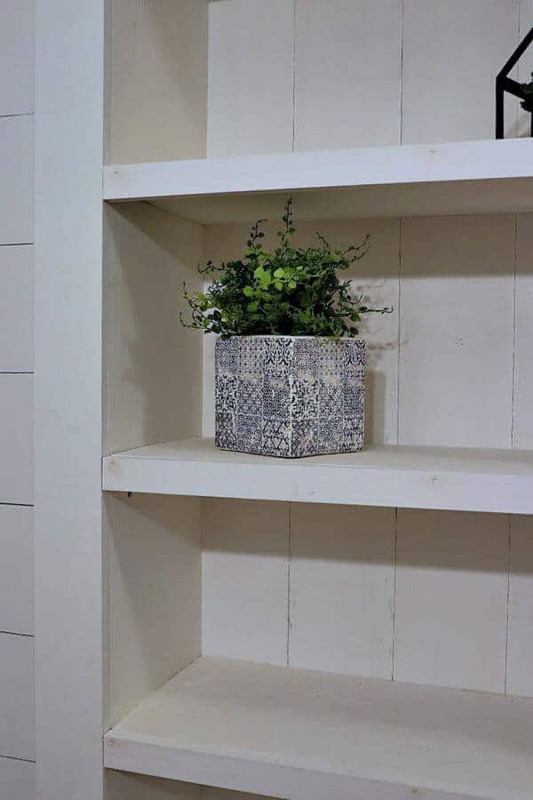 While looking for lumber, we found these cute little legs that just so happened to raise our vanity to the perfect height! Plus, the sink and faucet arrived so it gave us a peek of what it’s going to look like. 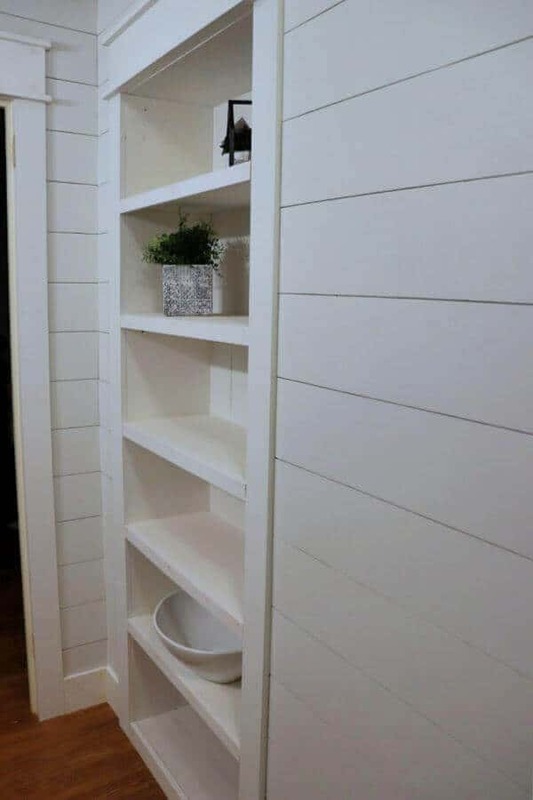 We finished the built-in shelves by adding the backing and trim to the front of the shelves. I primed them and are ready to paint! 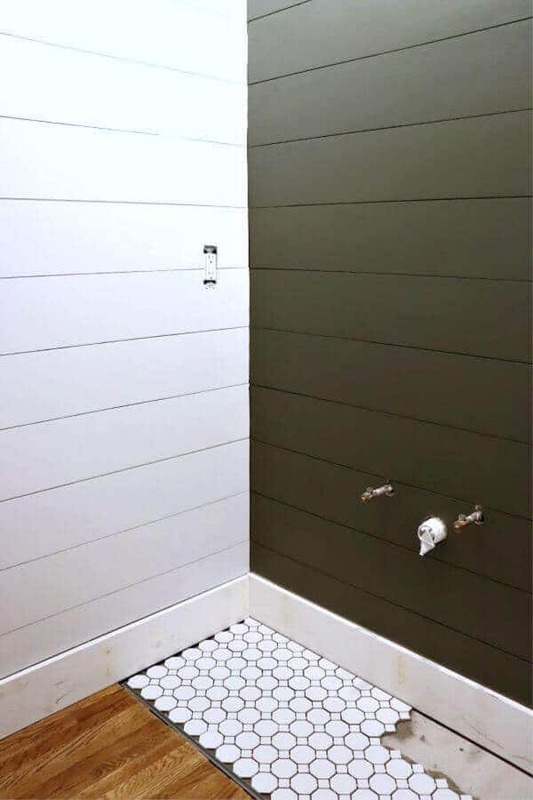 We painted our shiplap this week using Romabio’s new interior paint line. I’ll be sharing all the juicy details on their amazing paint later this week. And this color – so gorgeous! This green is blowing my mind. 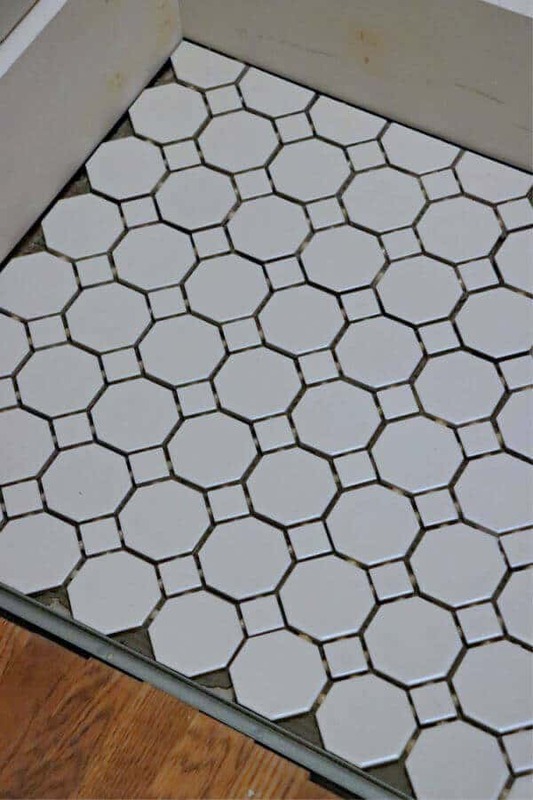 And see that new tile? We opted for something simple and classic for our flooring and I’m so pleased with the choice. Since we have such a small bathroom, we could afford to up the price just a bit and it’s so worth it. 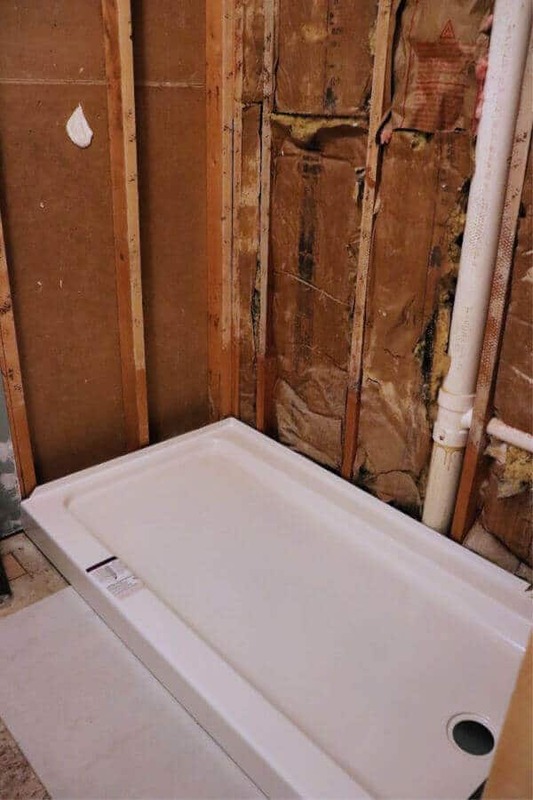 So we haven’t started tiling our shower yet, the bathroom vanity isn’t hooked up, and there isn’t a toilet in our bathroom. And we only have 2 weeks. It’s going to be tight and I’m coming to the realization that it very well may not happen. That age old saying of “Failing to plan is planning to fail,” is true. To hit a deadline, like the One Room Challenge, you need to have an action plan in place and we didn’t this time. It’s a tough challenge with major overhaul like a bathroom gut and remodel. Even so, I’m loving how this turning out. And, like you, I can’t wait to see the big reveal! Stay tuned for next week – fingers and toes crossed! Wow! What you have done thus far is beautiful! Yes, you absolutely must have a plan in place, and plans B, C, and D… just in case! I have had days that I was actually praying that I wouldn’t need to cancel on of the trades because I had them scheduled back-to-back! Fortunately, I had a crack team and it all worked out! Good luck!